This is a sponsored post by Whole Foods Market. Thank you for supporting the brands and companies that make this website possible! My recipe today, Vegan Spicy Chickpea and Mango Wraps is part of a special theme here at The Healthy Family and Home where I will share with you how easy it is to buy organic, high-quality groceries and make “5 Affordable Weeknight Dinners” by shopping at Whole Foods Market using fresh, responsibly grown, local and Whole Trade produce and their 365 Everyday Value Brand ingredients. 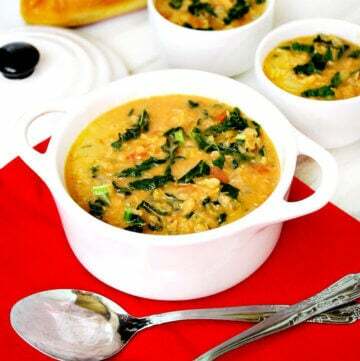 And, make sure you check out the other 4 dinner recipes below that you can make using high quality ingredients at great prices from Whole Foods Market! 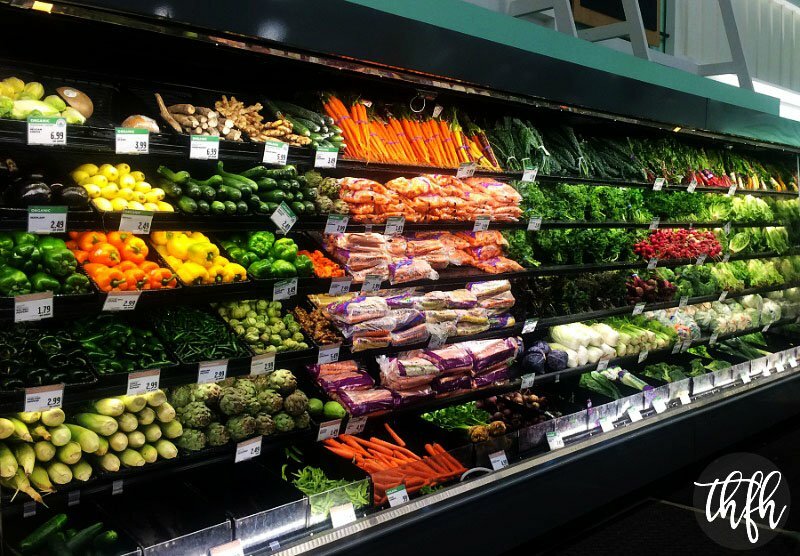 If you’ve never shopped at Whole Foods Market before, or purchased their 365 Everyday Value brand, I think you will be pleasantly surprised at the quality and value. 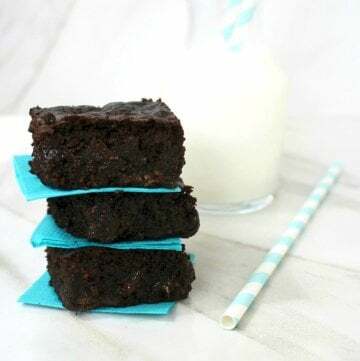 You can be assured when you buy the 365 Everyday Value brand foods, they will not contain high-fructose corn syrup, no hydrogenated fats and no artificial colors, flavors, preservatives or sweeteners. This is really important if you are following a clean eating diet. 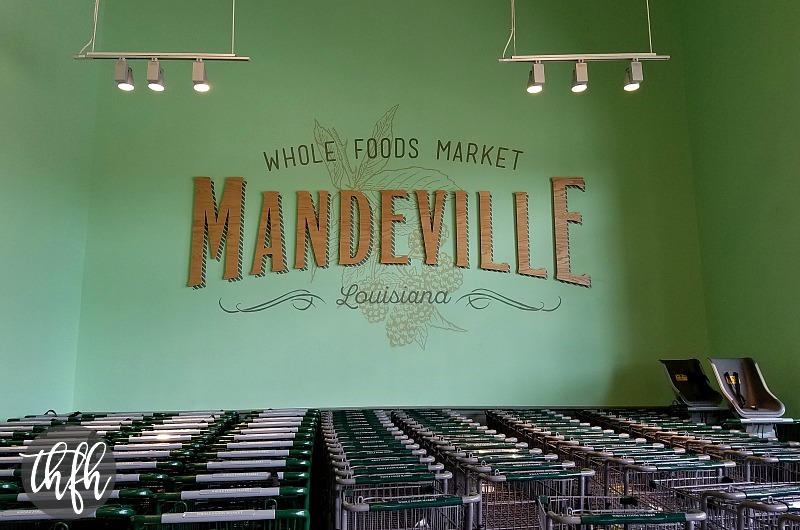 My local store is in Mandeville, Louisiana which is about 20 minutes from New Orleans, Louisiana and about 45 minutes from Baton Rouge, Louisiana. It’s a brand-new store that opened in 2016 and I couldn’t wait for it to open! I previously shopped at both the New Orleans and Baton Rouge stores for many years before this new location opened. In fact, I’ve been shopping at Whole Foods Market for over 10 years and my first trip there was when I started my clean eating journey when my oldest son was born. I wanted only clean and organic foods and produce and Whole Foods Market is where I bought them. Over the past 10 years, our grocery budget has had it’s share of ups and downs, but one thing that was always, and still is, important to me was buying quality food. I never had to worry about not having high-quality foods, especially when counting pennies. Quality? Check! Taste? Check! Price? Check! I’m proud to say that both my boys have grown up with the 365 Everyday Value brand and I thank Whole Foods Market for offering the best products at the best prices. 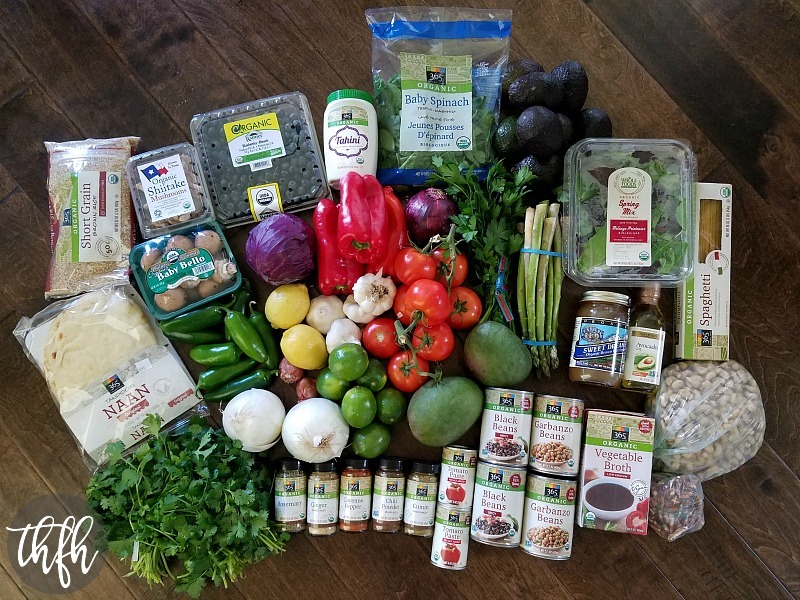 My mission on this shopping trip was to purchase enough ingredients to make “5 Affordable Weeknight Dinners” that were quick, simple and plant-based/vegan using fresh organic produce and ingredients from Whole Foods Market. The groceries needed for the 5 meals are ingredients essential to the recipes I’m going to share with you. I didn’t include basic spices (although I did pick up a few while I was there!) 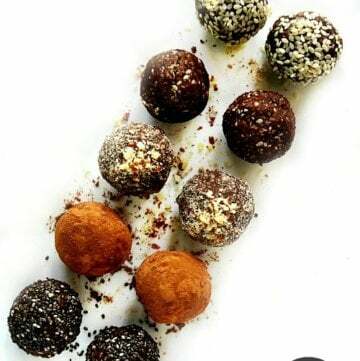 like Himalayan pink salt (or sea salt), ground pepper, ground ginger, ground cumin, ground cayenne, etc. And, some of these ingredients you may already have like brown rice, spaghetti, tahini, etc. You can see how buying Whole Foods Market brand foods “365 Everyday Value” helps you to save everyday. They make high quality foods affordable to everyone, every day. 98% of everything I bought for this shopping trip was organic. 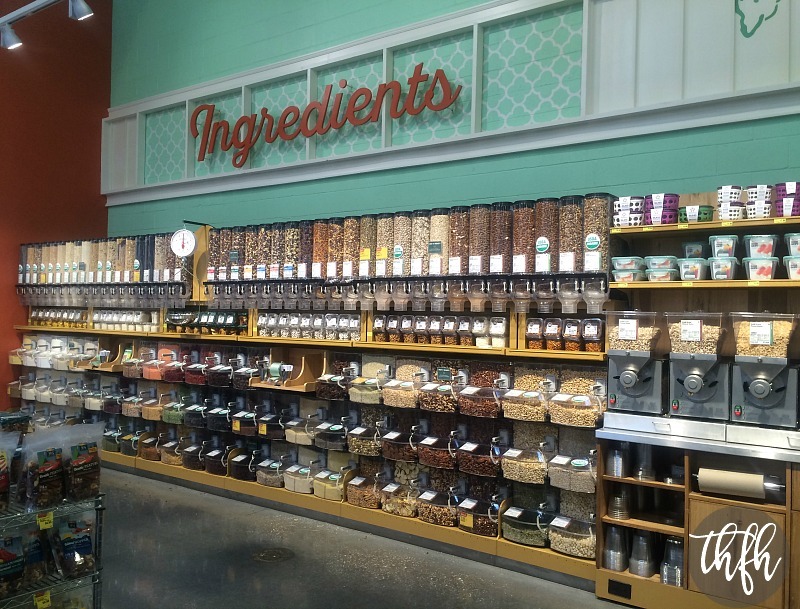 Whole Foods Market offers the broadest selection of natural and organic products at the best prices so you can stock up on pantry staples. I am a very avid price shopper and I have done several different price comparisons of everyday items just like the ones on this grocery list and the 365 Everyday Value brand just can’t be beat, especially when the majority of items in their line are organic. 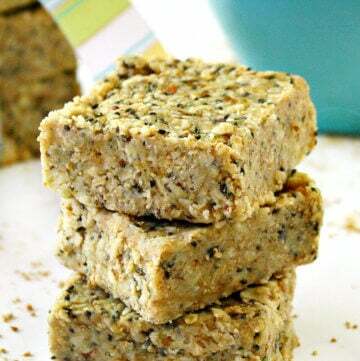 You can see how there are many items on my grocery list that can be used in other recipes and meals: garbanzo beans, vegetable broth, tahini, brown rice, baby spinach, spring salad mix, cashews, brown rice syrup, avocado oil, garlic, cilantro, jalapenos. You can use these ingredients to make salads or snacks for lunch extending your grocery dollars even further. 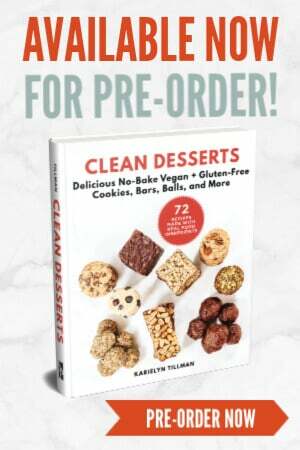 And if you’ve just started eating clean or plant-based, you will have purchased a good supply of staple pantry items. 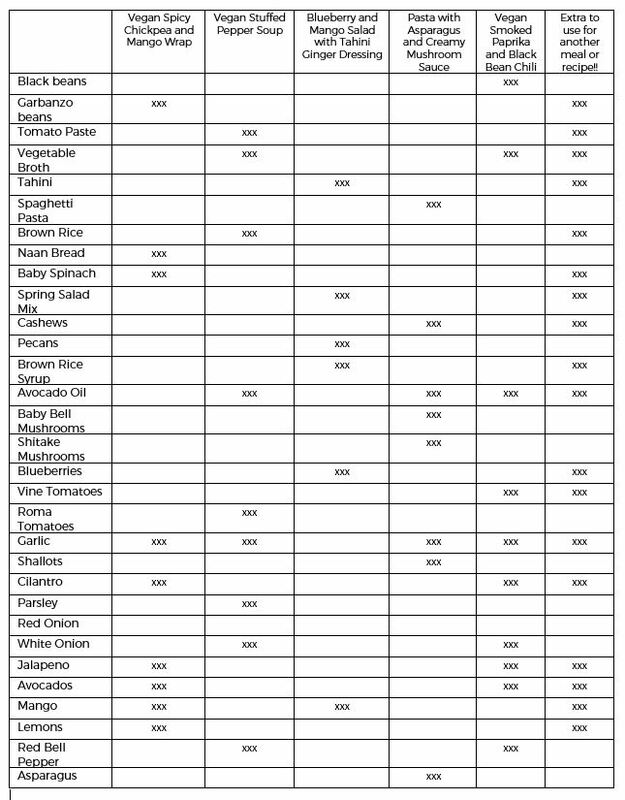 Just take a look at the chart below to see how many ingredients that were purchased for the “5 Family Meals” theme that can be used for other meals or recipes! Whole Foods Market has a great variety of organic produce which I used to make the “5 Affordable Weeknight Dinners”. I bought all the produce needed to make the 5 meals (with extra produce left over!) and it totaled $57.08. And, it was 98% organic too! One of my favorite things to buy from the produce section is the big 5 pound bag of organic juicing carrots to make fresh juice with. Definitely a great value! Since half the ingredients I bought to make the (5) dinners were fresh produce (#goals – this is a good thing!) let me share a little bit about what makes Whole Foods Market produce department so different. I have to admit, when I buy my produce, my number one concern is making sure it’s organic. But at Whole Foods Market, there are many other positive things going on behind the scenes that sets them apart with produce standards like nowhere else. “Responsibly Grown” – this is a system that Whole Foods Market uses to reward farms for things like nurturing healthy soil, using renewable energy, reducing waste, protecting farmworkers, protecting waterways and conserving water, protecting wildlife (including pollinators), reducing or eliminating pesticides, providing GMO transparency, eliminating irradiation and eliminating biosolids. “Whole Trade Guarantee” – Whole Trade produce (and flowers!) are 3rd-party certified for ethical trade, environmental care, high-quality and supporting poverty alleviation. I love how their “Whole Trade Guarantee” makes a difference in the lives of real people and the environment. Local Produce – Whole Foods Market also features locally grown produce which connects us to the people who produce the foods we consume while ensuring our food is at its peak of freshness and flavor. Two of my favorite locally grown produce items I like to buy from my Whole Foods Market are sweet potatoes and tomatoes. So much more than just buying organic! What would I do without the Whole Foods Market bulk bins! One of the ways I stretch my grocery dollars is to use the bulk bins to buy in bulk and save. I use the bulk bins regularly for so many things like medjool dates (raw desserts, snacks, smoothies), raw cashews (homemade cashew butter, raw cheesecakes, homemade dressings), raw almonds (homemade almond butter, homemade almond milk), raw pecans (salads, desserts, snacking), raw walnuts (salads, desserts, snacking), oats (homemade oatmeal, desserts, homemade oat flour), rice, quinoa, nutritional yeast, dry beans, lentils, chia seeds, etc. 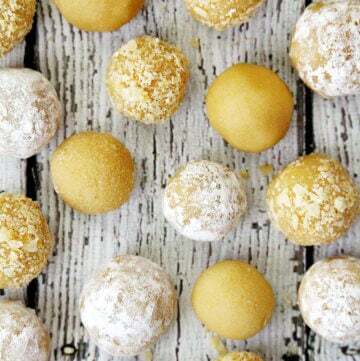 My husband loves the gingerbread snap cookies so much, we ~always~ have to get at least a pound from the bulk bin every shopping trip, and he goes through that in a week. I even know the product code by heart #7666! One of the main benefits of buying from the bulk bins is you can buy only what you need. 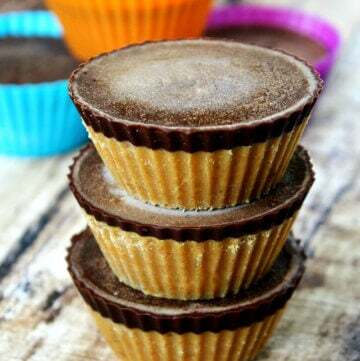 Have a recipe that needs only 1/2 or 1 cup of something? Just get the exact amount you need from the bulk bin and not only will you save on the cost, but you’ll have less packaging. Less packaging means less waste. I store all my bulk bin items in glass mason jars or BPA-free containers. 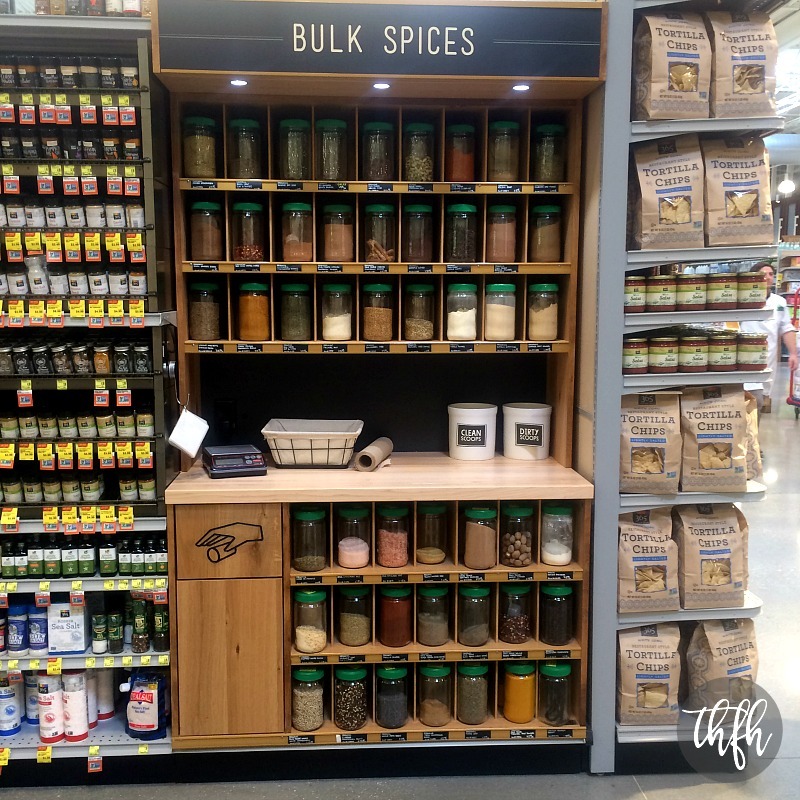 Just like the regular bulk bins for nuts, seeds, grains and more, Whole Foods Market has a bulk spice section which is really great when you have a recipe that calls for a spice you don’t have, or probably won’t use very often. Just buy a scoop instead of having to buy an entire bottle of spice for one recipe. And lastly, the high-quality canned goods that are affordable for everyone, every day. 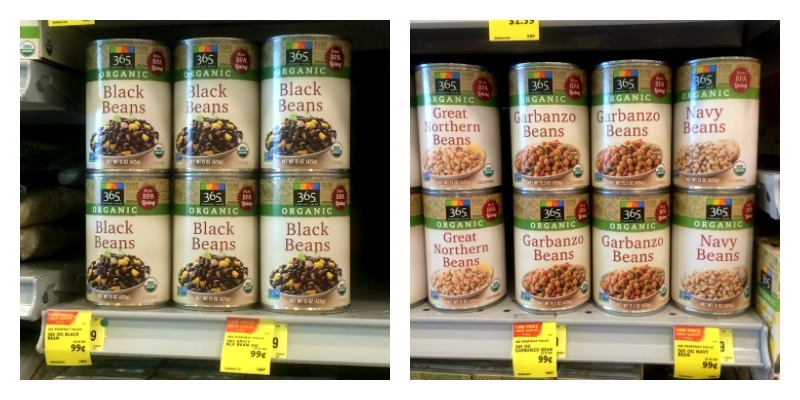 I love how the 365 Everyday Value brand offers basic pantry staples like black beans, navy beans, garbanzo beans, corn, etc. with many being organic ~and~ they even have some canned goods with BPA-free lining too! Now, let’s look at the recipes that make up the “5 Affordable Weeknight Dinner from Whole Foods Market” theme. 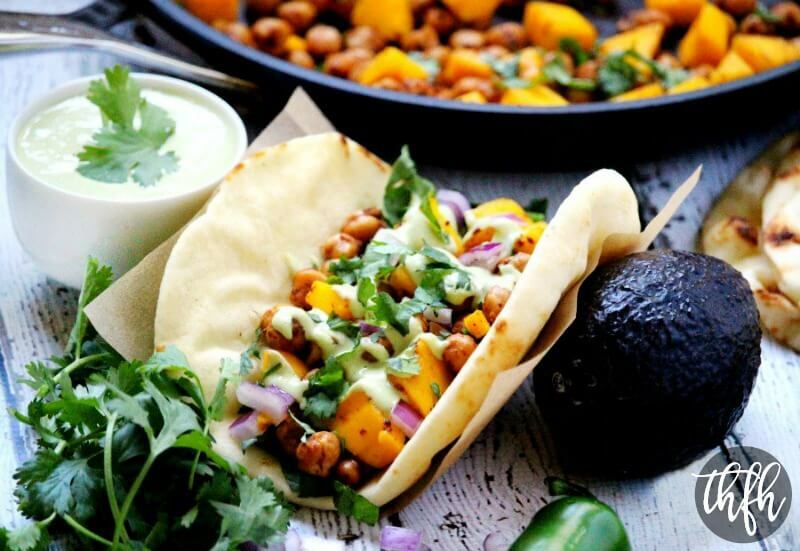 The first recipe is these Vegan Spicy Chickpea and Mango Wraps which are made with chickpeas that are sautéed in chipotle powder, garlic and a little Himalayan sea salt. Next, they are tossed with fresh diced mango and fresh chopped cilantro. I used the 365 Everyday Value Naan Bread for the wraps, then layered it with a fresh guacamole-style spread, then fresh chopped spinach, then the spicy chickpea and mango mixture, then some purple onions and lastly, drizzled a creamy homemade jalapeno dressing over the top. The entire meal is ready in less than 15 minutes! 1 bag "365 Everyday Value Naan Bread"
Prepare the veggies and fruit: Dice the onions and jalapeno, chop the spinach and cilantro, peel and cube the mango. Set aside. Add the can of garbanzo/chickpeas (drained), avocado oil, chipotle powder and Himalayan pink salt to a skillet and saute' on medium/high heat for approximately 4-5 minutes, or until the garbanzo/chickpeas are slightly crispy. Remove from heat and add the cubed mango pieces and chopped cilantro. 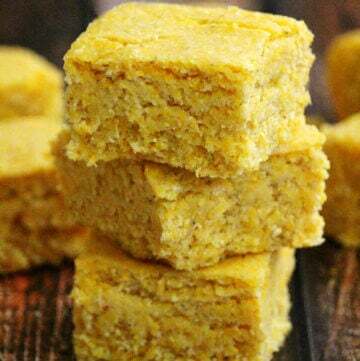 Gently toss the mango and cilantro with the garbanzo/chickpeas until they are slightly covered with the chipotle seasoning. Adjust seasonings to your preference. Set aside. Add the avocado to a small bowl and mash with a fork until it becomes creamy and smooth. Add the remaining ingredients for the avocado spread and stir everything together well. Adjust seasonings to your preference. Set aside. Add all the ingredients for the jalapeno dressing to a Vitamix and blend until it is creamy and smooth. Adjust seasonings to your preference. Set aside. 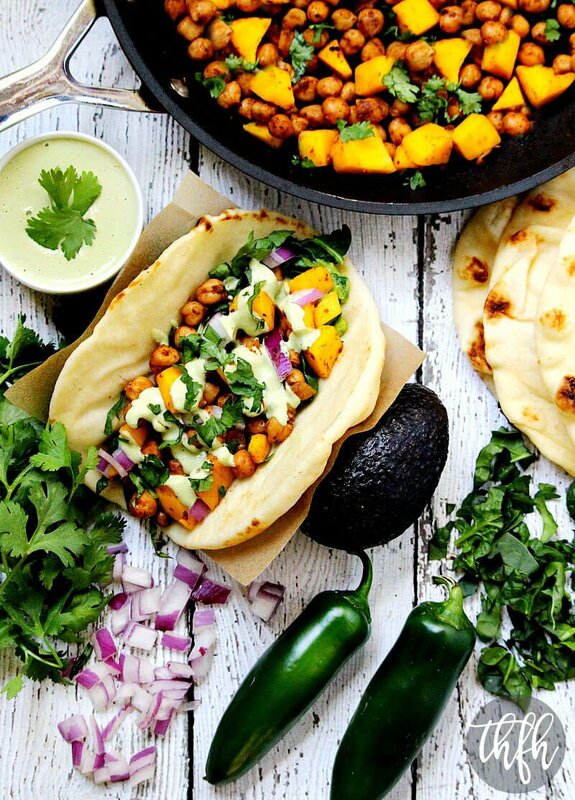 Fold the Naan wrap as you would a taco shell and enjoy! The recipe and photographs for "Vegan Spicy Chickpea and Mango Wraps" by Karielyn Tillman of The Healthy Family and Home website are licensed under a Creative Commons Attribution Non-Commercial No Derivatives 4.0 International License and cannot be used without my written permission. 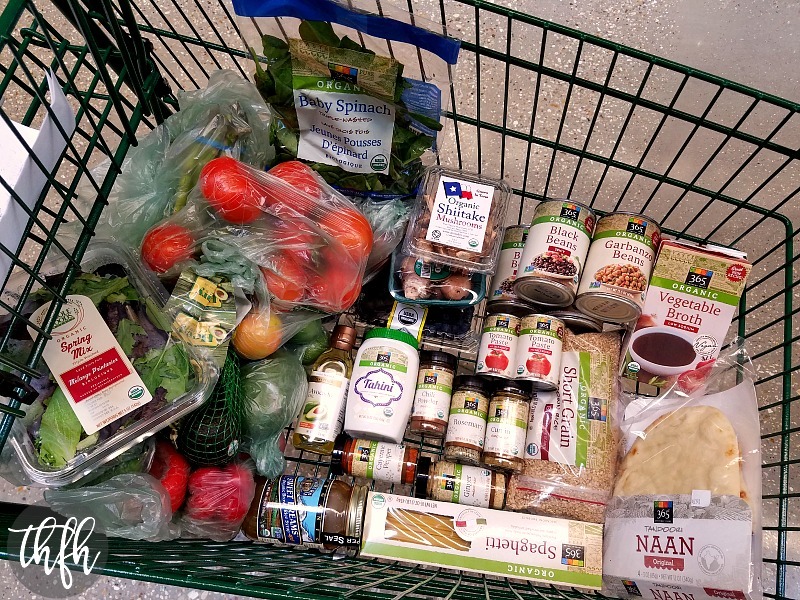 For all these recipes, I used the 365 Everyday Value brand organic canned goods, spices and packaged foods like pasta, brown rice, tahini, vegetable broth and utilized the convenience of the Whole Foods Market bulk bins for items like organic pecans and organic cashews. 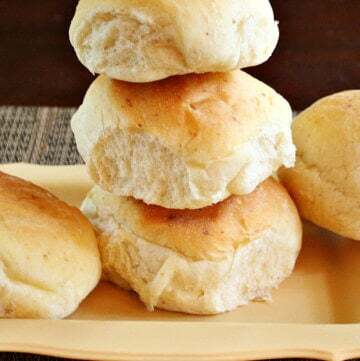 Here are some tips on how to use leftovers and ways to cut corners to make your quality ingredients last to save money! You’ll have extra spinach and onions left over from this recipe. Even though you won’t need to use the entire onion or entire bag of spinach, go ahead and pre-dice your onions and pre-chop the entire bag of spinach while you are prepping for this recipe and store the extras in an air-tight BPA-free container in the refrigerator. Use them both in a quick salad or in another soup recipe, toss some spinach in a smoothie, or saute’ them in some avocado oil with another can of chickpeas seasoned to your preference for a quick lunch. You’ll have extra dressing left over from this recipe – save it to use later with a salad or a dip for fresh veggies and store it in an air-tight glass container in the refrigerator. 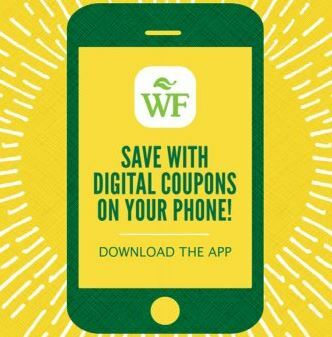 And speaking of saving money, there’s a Whole Foods Market app available to take advantage of special sales and digital coupons. Just download the Whole Foods app so you’ll never miss a sale and subscribe to the Whole Foods Market newsletter to stay up-to-date.